In this brief article, we hope to bring some perspective on what is being called “impartation”, “anointing” and “manifestation” that is said to be at the heart of the revivalism of the Charismatic and Pentecostal “River” movements. As you will see, this is not a “formal” paper in that everything is footnoted. This article is simply a product of what we have read and studied regarding the practices and teachings of the “revivals” that once burned brightly at the Toronto Airport Christian Fellowship, the Brownsville Assembly of God, and other so-called “power” centers where “the River of God” supposedly flows today. At the conclusion of the article is listed the sources that were consulted that contained full documentation. The experiences of Toronto and Brownsville are called “impartations” or “manifestations.” These type of emotions or experiences have appeared in the past revivals, but usually are rejected by the leaders and revivalists as being disruptive due to their carnal or Satanic origins. Such experiences come forth among Pentecostal and Charismatic believers since they are imparted out of reaction to an excited religious environment rather than generated as a response to God through an inward spiritual life already internally present. They are external and are physically manifested in human behavior, rather than proceeding from the spiritual fruit in the heart and mind of the believer. This is a clear distinction easily and quickly lost in the heat of a charged moment around crowded altars and under the exhortation of earnest, fiery ministers. These “manifestations” are meant to be behind virtually every physically displayed action observed in these “River” meetings. They include – but are not limited to – shaking, weeping, speaking in tongues, being “slain by the Spirit” as well as barking like dogs, roaring like wild beasts and women giving “birth to the Spirit” through “labor pains” in which they endure contractions, screams of agony and even the soiling of their clothing. Such “offense” is said to be a divine manifestation of God’s Spirit He uses to “expose” some hidden spiritual deficit among those not manifesting the same way. The idea is that modern “fivefold” prophets and teachers can dispense spiritual gifts to believers at will is a very serious misinterpretation of Scripture. The apostle Paul’s exhortation to Timothy is often used to substantiate this teaching: “For this reason I remind you to fan into flame the gift of God, which is in you through the laying on of my hands” (2 Tim. 1:6). The gift that Timothy had is stated to be a “gift of God” that, according to popular belief among Pentecostals and Charismatics, is an irrefutably clear reference to the special spiritual giftings mentioned in 1 Corinthians 12 which involve gifts of tongues, interpretation, miracles and prophecy, among others. This, for many, is a “Holy Ghost blank check” meant to be gateway to the “deep things of God” all are to receive from the hosts of the “five fold ministry” all around today. Both Vine and Morris agree that the verse is not teaching an impartation of spiritual “sign” gifts as laid out in 1 Corinthians 12, but that the “impartation” Paul wanted to pass along to the Roman church was the sharing of God’s spiritual grace in His life that would encourage or strengthen them all together in the unity of the Spirit as members of the Body of Christ (“to the end that ye may be established: that is, that I may be comforted together with you by the mutual faith of you and me” – Romans 1:11-12). The laying on of hands referred to by Paul merely symbolized the recognition of their shared faith and comfort derived from God’s graces bestowed upon them. So Paul had been gifted by the Spirit with ability to encourage and strengthen, and he shared these gifts with others. The verses did not teach that any person could go around to donate the spiritual “sign” gifts to whomever he or she pleases. In Paul’s first letter to Timothy he reminded him, “Do not neglect your gift, which was given you through a prophetic message when the body of elders laid their hands on you” (1 Tim. 4:14). Here, Timothy was reminded not to ignore the gift that was given by God and affirmed by those in spiritual authority and responsibility. The prophetic utterances were not supernatural pronouncements designed to dispense and activate spiritual gifts at a prophet’s summoning. Rather, they were words of encouragement and exhortation confirming Timothy’s giftedness and his call to ministry. “But all these worketh that one and the selfsame Spirit, dividing to every man severally (idios; one’s own; by implication, private or separate; is also translated “acquaintance”) as he will (boulomai; “to wish, to will deliberately”) (KJV). The overemphasis relative to imparting, identifying, bestowing, or confirming of gifts by the laying on of hands and prophecy. The erroneous teaching that the Church is built on the foundation of present-day apostles and prophets. The extreme teaching as advocated by the “New Order,” regarding the confession of sin to man and deliverance as practiced, which claims prerogatives to human agency which belongs only to Christ. The erroneous teaching concerning the impartation of the gift of languages as special equipment for missionary service. The extreme and unscriptural practice of imparting or imposing personal leadings by the means of the gifts of utterance. This Assemblies’ precedent of Christian discernment had to be recalled, cited and lamentably expanded upon considerably in the recent 2001 Assemblies of God position paper on endtime revival (click to download a PDF document file of the paper). It went on to rightly observe that the questionable teachings on impartation, manifestations and a supposedly divinely ordained call for “apostles” and “prophets” were alive and well in contemporary times. And the paper also reminded readers that this excess was rooted in the Latter Rain “revival” among Pentecostals of the late 1940’s and that its’ elements of extremism were spread to the four winds of global Christian culture by the interdenominational shepherding movement that sprang up among the Charismatics of the 1970’s. Hidden in plain sight, this spiritual scourge continues almost unabated to this day. Despite the concept’s popularity and widespread influence in Christian circles everywhere, the truth must still be sounded out squarely: nowhere in Scripture do you find the Holy Spirit, a Divine Being, dissected in parts and distributed to people or places. This is foreign to our Christian faith. He can only enter your life as a Person and He does at the moment you are truly converted or born again. He is either in your heart and life or He is not. 1. Where does the real power come from? Without, from a impartation “received” or from within, from the residing person of the Holy Spirit? 2. Can someone arbitarily “impart” a blessing, a gift, a manifestation to someone else? There are many examples today that demonstrate how much imbalanced and unbiblical teaching exists that confuse and even blind Christians to Scriptural truth on the anointing of the Holy Spirit in the lives of believers. Such confusion only contributes to the ignorance of Pentecostal and Charismatic believers, when laboring under the excitement of revivalism, are led into false teaching out of good intentions. 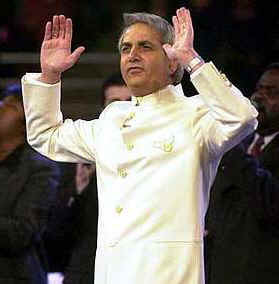 One glaring instance is found in the book entitled “The Anointing” written by Benny Hinn. He states that the believer lives at three different levels of “the anointing”. We are first saved (in a visitation of the Spirit called the “leper’s anointing), then we are baptized in the Spirit (through an enduement of spiritual power called the “priestly anointing”). He goes on to state that these two levels of “anointing” are necessary to seek and possibly receive a special third level called the “kingly anointing, the most powerful of them all” which “lifts a person to a place of high authority with God .. the most difficult to receive.” (4) On a TBN broadcast, Hinn speaks of visiting the grave sites of Kathryn Kuhlman and Aimee Semple McPherson, where he has felt “a terrific anointing” lingering over their remains (5), an “anointing” that even healed the sick brought to the graveside. He then defends these eerie practices by using the account of Elisha’s bones raising the dead. But the plain understanding of the Elisha account shows this was simply the manner that authenticated the fulfillment of God’s promise for him to have received the “double portion.” That in and of itself was unique, not normative. Nowhere else in Scripture do you read of anyone else receiving a “double portion.” Neither Christ or the apostles taught much less advocated seeking “levels” of spiritual anointing, so Hinn’s teaching is clearly not Biblical. That doesn’t keep so many others from replicating unscriptural claims about alleged planes of spiritual power to climb ladder like in spiritual progression. The word “anoint” means to authorize, or set apart, a person for a particular work or service (Isa. 61:1). The anointed person belonged to God in a special sense. The phrases, “the Lord’s anointed,” “God’s anointed,” “My anointed,” “Your anointed,” or “His anointed” are used of Saul (1 Sam. 26:9, 11), David (2 Sam. 22:51), and Solomon (2 Chron. 6:42). Priests, kings, and prophets were anointed. 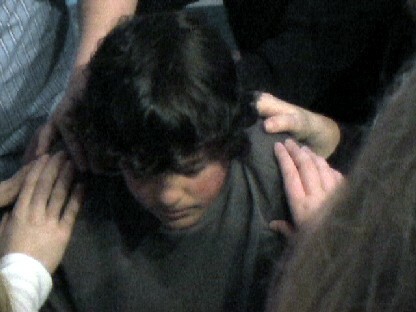 Oil was poured on the head of the person being anointed (Ex. 29:7). Kings were set apart through the ritual of anointing, which was performed by a prophet who acted in God’s power and authority (1 Sam. 15:1). The Old Testament also records two instances of the anointing of a prophet (1 Kin. 19:16; Isa. 61:1). The Lord Jesus Christ is known as the Messiah, which literally means “anointed one.” This description is found in the Psalms of the Old Testament which prophesies the coming of Christ and in the preaching of the apostle Peter in the Book of Acts. In the New Testament, all who are Christ’s disciples are said to be anointed; they are God’s very own, set apart and commissioned for service (2 Cor. 1:21). In the New Testament, anointing was frequently used in connection with healing. Jesus’ disciples anointed the sick (Mark 6:13), and James instructed the elders of the church to anoint the sick with oil (James 5:14). This anointing was for the purpose of healing. The Holy Spirit’s activities in a believer’s life are pictured in terms associated with anointing. Anointing in the New Testament also refers to the anointing of the Holy Spirit, which brings understanding (1 John 2:20 “But you have an anointing from the Holy One, and all of you know the truth.” “As for you, the anointing you received from him remains in you, and you do not need anyone to teach you. But as his anointing teaches you about all things and as that anointing is real, not counterfeit – just as it has taught you, remain in him.”(v. 27). This anointing is not only for kings, priests, and prophets; it is for everyone who believes in the Lord Jesus Christ. A physical anointing with a substance such as oil, myrrh, or balsam could be implied in these references, but the primary references are to the spiritual anointing of the Holy Spirit that anoints and sets apart a person’s heart and mind with the love, truth and missional call of God to ministry. The word “fullness” literally means to cram (a net), level up (a hollow), or (figuratively) to furnish, satisfy, execute (an office), finish (a period or task), verify (or coincide with a prediction). All that is necessary to secure salvation and Christian living is found in Jesus Christ. There is a completion, or a filling up, in Him, so as to leave nothing wanting. If in Christ, we have been given filled completely, why be anointed with the prayer “More, Lord” or “Fill, fill, fill”? 16 “So I say, live by the Spirit, and you will not gratify the desires of the sinful nature. 17 For the sinful nature desires what is contrary to the Spirit, and the Spirit what is contrary to the sinful nature. They are in conflict with each other, so that you do not do what you want. 18 But if you are led by the Spirit, you are not under law. 19 The acts of sinful nature are obvious: sexual immortality, impurity, and debauchery, 20 idolatry and witchcraft; hatred, discord, jealousy, fits of rage, selfish ambition, dissensions, factions 21 and envy; drunkenness, orgies, and the like. I warn you, as I did before, that those who live like this will not inherit the kingdom of God. 22 But the fruit of the Spirit is love, joy, peace, patience, kindness, goodness, faithfulness, 23 gentleness and self-control. Against such things there is no law. 24 Those who belong to Christ Jesus have crucified the sinful nature with its passions and desires. 25 Since we live by the Spirit, let us keep in step with the Spirit” (Gal. 5:16-25). 17 “Now the Lord is the Spirit, and where the Spirit of the Lord is, there is freedom. 18 And we, who with unveiled faces all reflect the Lord’s glory, are being transformed into his likeness with ever-increasing glory, which comes from the Lord, who is the Spirit.” (2 Cor. 3:17-18). 1. Are the “manifestations” seen in these movements (being slain in the Spirit, jerking, laughing, roaring, etc.) a “manifestation” of the Spirit? Can they be attributed to something else rather than the Spirit? 2. Are these above “manifestations” more for the individual than for the “common good”? 3. How do these “manifestations” transform a believer into the likeness of Christ? 4. Where does the “fruit of the Spirit” apply? If the seed was bad, then the fruit must be as well. (4) Hinn, Benny. 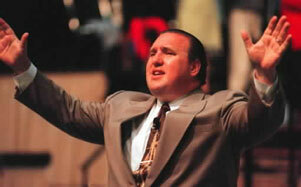 The Anointing (Thomas Nelson, 1997), pp. 89, 90, 94. (5) Benny Hinn’s admission in a 1991 sermon at his Orlando church entitled “Double Portion Anointing” is the source of this documented claim that he frequents the graves of Kathryn Kuhlman and Aimee Semple MacPherson to top up his “anointing” tank. It is perhaps one of the most surreal and troubling statements he has made (and he’s made a fair share of strange ones over the years). It smacks of a magical and detestable superstition that smacks of the foul sin of necromancy. See chapter 15 of The Confusing World Of Benny Hinn (Morris, 1999), a compilation of research articles by Personal Freedom Outreach on Hinn’s controversial teachings.